Mark Poropat , owner of St Clair Machine in Northern Florida has been a machinist and machine shop owner for many years. Like many of us, Mark’s eye site is not what it used to be. As we all age, we depend on bifocals, magnifying eye glasses (“cheaters,”) etc. to enhance our vision. Through the utilization of different magnification devices, Mark has been able to continue to be fully active in the operations of his machine shop, including machining parts. He decided to upgrade all the mills, lathes and grinders in the shop with Digital Readout (DRO) systems, and wanted to consider Newall as the recommended DRO for this purpose. 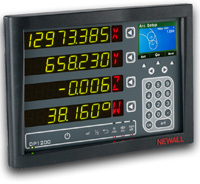 A few years ago, Newall simplified the DRO display cabinet selection process, by introducing the concept of having one digital readout display for smaller tool room size machines ( the DP700,) and a different, larger digital readout display for larger, long travel machines (the DP1200.) The idea being, the larger, longer travel machines require improved visibility of the DRO system’s numerical displays, so the DP1200 was created. The LED displays on the Newall DP1200, are a full 60% larger than the industry standard LED displays found in other DRO’s. Now in theory, with only two displays offered, the choice is easy. Instead of leaving the burden of what display feature set to select up to the customer, the idea now is “what type of machine is it for?” For smaller, tool room size machines the DP700. For longer travel machines, the DP1200. Newall Electronics’ concept of having one digital readout display cabinet for large machines has actually produced a side benefit for Mark. When deciding to upgrade his standard size knee mills, tool room lathes and surface grinders in the entire shop, he equipped all his machines with Newall DP1200 DRO systems. The larger than normal LED displays makes it easier for Mark to know his machine position at all times. Mark is now better able to produce parts on his mills, lathes and grinders equipped with Newall DP1200s. Additionally, The Newall Spherosyn and Microsyn scales, which require no maintenance, makes it simple for Mark to keep his digital readout systems performing to their maximum capability. To learn more about the DP1200 and its other unique, efficiency boosting features, please contact a Newall representative.